U.S. Representative Mike Michaud announced his candidacy for Governor at a press conference held at the Franco-American Heritage Center in Lewiston on Thursday. 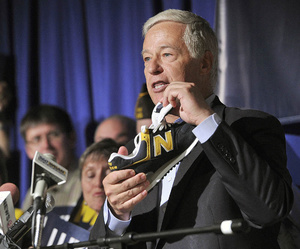 Michaud, a proponent of Maine made products, holds a pair of New Balance shoes. In what was an expected move, five term Congressman Mike Michaud formally announced his intentions to run for Governor of Maine last week. He chose Lewiston, long a stronghold of his and birthplace of Paul LePage, as the site of his announcement and immediately drew attention to his Republican rival’s long history of national attention grabbing, negative comments as he promised to restore dignity to the state. Michaud showed his supporters his newly acquired, custom made New Balance campaign shoes- and then spent the next few days canvassing much of the state with stops Friday in his hometown of Millinocket (a meet-and-greet at the New England Outdoor Center) and even speaking with Republicans at Scarborough’s Summerfest that evening, kicking off a Portland Democratic canvas early Saturday morning before a 10 am rally for Sagadahoc Dem’s Eloise Vitelli (Senate District 19 candidate) in Bath. 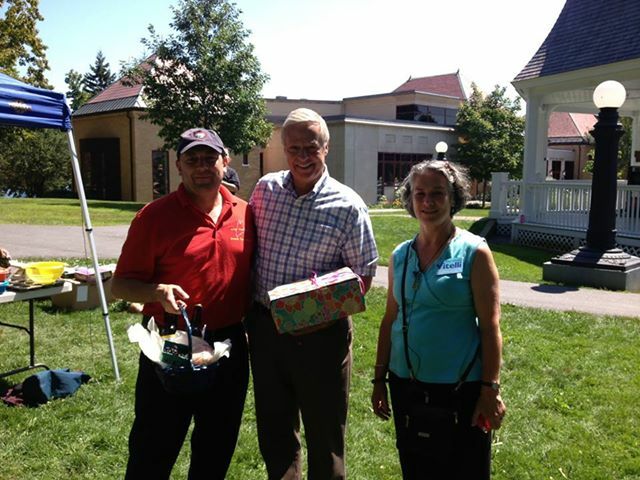 Troy Jackson, Mike Michaud and Eloise Vitelli at Neighbor Helping Neighbor festival, benefitting the Bath Area Food Bank, at Library Park in Bath. From Bath, Mike and Maine’s new Senate Majority Leader Troy Jackson, who is currently considering a run for Michaud’s 2CD open seat and expected to formally announce soon himself, traveled to host the Hancock County Dems’ Great Democracy Auction fundraiser with fellow Dems and 2CD hopefuls State Senator Emily Cain and Bangor City Councillor Joe Baldacci- but first, Mike had a few more stops at the Lincoln County Democrats Lobster Bake in Walpole and in Owls Head, for the Knox County Democrats summer Lobster Bake. Sunday, Mike and NH Governor Maggie Hassan were at the Maine Democratic Party’s lobster bake in Freeport, then Monday he cheerfully manned the phones in Portland, calling supporters and ending the day with an interview of WCSH’s “207”. He spoke of his experiences in the Legislature and of how he intends to work with members of both parties, as well as laid out his plans and focuses as Governor. Where will Mike Michaud appear next? Who knows- but from what is being witnessed so far, one can expect this will be an energetic, high profile and statewide campaign.